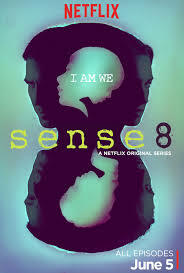 Earlier this year, Netflix released a number of original series, including Sense8 — created by the Wachowskis, of Matrix fame. The series takes its focus on eight strangers who live in different parts of the world, and become intersubjectively connected to each other. The “sensates” share each other’s most intense affective experiences, ranging from agonies to orgasms. Sense8 is a confused, fascinating attempt to think the global in terms of emergent conditions of human sociality. The series conceives of a networked existence, not at all structured by postmodern disembodiment, but by new modes of embodiment that are particular to the geo-imaginary of the contemporary moment. What seems most remarkable about the series is its attempt to represent a globality of the present unhinged from the geo-imagination of digital technologies. Instead, this counter-globalization is enacted as a network of various bodies in physical space – the total annihilation of time by space, which outmodes the digital with the corporeal conception of the global as a terrain of transforming socialities. 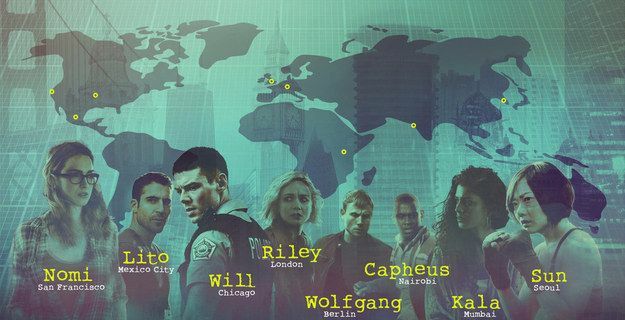 While The Matrix, the Wachowskis’ previous franchise, constructs a conspiratorial spatial imaginary of global capitalism premised upon infinite separation and dematerialization, Sense8 takes a far different orientation toward actual space and virtuality. The virtual is not, as in The Matrix, an analogy to our digital postmodern existence, but reflects conditions of actualization in the Deleuzian sense. The actual, Deleuze suggests, “surrounds itself with a cloud of virtual images. This could is composed of a series of more or less extensive coexisting circuits, along which the virtual images are distributed, and around which they run.” The problem of the series is precisely the Deleuzian problem of ontologizing a perfectly useful epistemology. 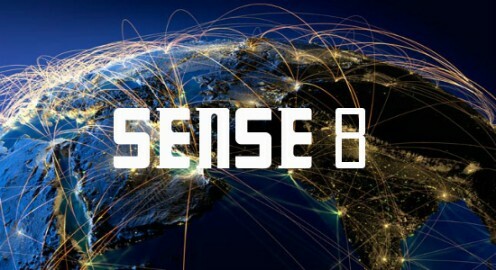 Although Sense8 does not represent digital technologies – and instead conceives of human connectivity in terms of bio-terrorism – the geo-imaginary of the series bares the representational limits of globality in the digital era. The opening credits of the series captures this total google-mappification of the world, and our contemporary imagination of the planet. Cutting between various urbanscapes, the credits merge the heterogeneities of an emergent global image of the present – a pastiche of images that articulate the instagramming of social life, but also the total occlusion of processes of circulation, production, and distribution. While mirroring the temporal logics of immediacy and constancy in contemporary capitalism, this dizzying mash-up of global cities also demonstrates the invisibilization of capitalist infrastructure. Where is the sea in this geo-imaginary? Where are the container ships – and where are the wars? Where is the Middle East? The Global South? These lacunae are symptoms. Sense8 is a valiant failure, a show of dizzying aspirations to positively represent the unrepresentable—a fully globalized and liberated subjectivity. In the first episode we witness the rebirth of eight emblematic postmodern subjects, as they begin their new life as a cognitive and emotional unit who can communicate and visit with each other through an empathic link, even though they live in far-flung regions of the globe—Nairobi, Seoul, Mexico City, Chicago, London, Berlin, Mumbai, San Francisco. The series’ ambition is political, from the left, imagining a queer politics that allows a cluster of people to evolve beyond atomization and cultural constriction. In an age which denigrates all hopes for transformation beyond an individuated passivity, this rare attempt to depict collective consciousness in a utopian mode is laudible. This project has previously been undertaken only by a few sixties-oriented cultural works such as Theodor Sturgeon’s science fiction novel More Than Human and the 1974 film Phase IV. In our moment in which There Is No Alternative to capitalist atomization and the global sublime, it is easier to imagine the end of the world than the end of individuality. And yet, the attempt to make this imaginative leap comes at the price of reinstating individuality on a higher level. It is not from a sense of pessimism that Fredric Jameson notes: “Utopias have something to do with failure and tell us more about our own limits and weaknesses than they do about perfect societies” (“Utopia and Failure”). Jameson’s aim, rather, is to show that success does not entail turning away from or ignoring the structural limits of the utopian imaginary. Madeline qualifies Sense8’s lacunae as “the invisibilization of capitalist infrastructure.” This is symptomatic of a faith in subjective release into a kind of empathetic hive-mind and body detached from the objective conditions that confound this liberation. Instead, what Herbert Marcuse called “repressive desublimation” serves to systematically occlude alienated social relations, the commodification of desire and the division of labor now writ large in global uneven development. In this context, the first episode’s depiction of a San Francisco gay pride parade as an outside to the extreme gentrification, militarization and medicalization of everyday life, marks the structural limits of liberatory fantasy, as much as it does the desire for actual subjective freedom and sexual expression. The desire for an inclusive sociality both sublates and occludes a real global city, San Francisco, in which social acceptance and bohemia increasingly elide the draconian exclusion of the poor and criminalization of homelessness. The fantasy of a gentle, bucolic, gender-queer San Francisco, presents us with a fascinating dialectic of utopia and reification, with a utopian prefiguration of a world in which globalization subsumes rather than entrenches corporeal alienation and a reified concretization of what that would look like. There is a famous passage in Imagined Communities where Benedict Anderson discusses the emergence of the novelistic technique of simultaneous narration. This kind of narration – now familiar to us all – describes the experience of various inhabitants of a city who, unknown to each other, all discuss a local event, scandal, or rumor as they wake, begin work, and go about their days. Such a vision of simultaneity was unthinkable, Anderson argued, before nationalism, and especially before technologies like newspapers, mass-produced vernacular print culture, and standardized local time made it possible to think disparate individuals as part of a single national community coexisting on a given calendrical day. Sense8 represents a faltering attempt to think through the nature of simultaneity in a fully globalized regime of multinational capitalism. In this world, the imagined community is not the nation but – potentially at least – the globe. Kala can’t shake the feeling that it is raining despite the sunny Mumbai skies above her. Will is woken in his Chicago apartment by the sound of blaring techno music with no identifiable source. The source of Will’s mysterious, 3:00 AM techno is Riley Blue, our Icelandic DJ performing at that very moment in a London nightclub. Similarly, Kala hears rain despite the fair weather because her counterpart Wolfgang is being drenched by a typical Berlin downpour. In this fantasy of utopian globalization and simultaneity, technology is suspiciously absent, as Madeline pointed out. It is not digital platforms like FaceTime or the breathtaking speed of international financial transactions that symbolize the increasing global simultaneity of our moment but rather a much older and more retrograde technology: the human brain. Various hints given over the course of the first season provide a vaguely scientific and thoroughly woo-woo explanation for the new-found ability of these characters to remotely tap into each other’s thoughts, skills, and experiences: limbic resonance. The term was popularized by the 2001 study A General Theory of Love, which set out to establish a biological and neurological basis for the human ability to empathize and love. Challenging both mind-body dualisms and the scientific-rationalist emphasis on the atomized individual, the book argues that a mammalian capacity for empathy is hard-wired into our bodies. According to this research, our very nervous systems are altered by others and can even ‘sync’ with those with whom we are close. In the imaginative world of Sense8 this capacity for empathy is physically and emotionally intensified between members of a ‘cluster.’ Just as the two hemispheres of each of their brains begin to fuse, so too are the hemispheres of the globe fused as the sensates begin to empathetically take on each other’s psychological and physical experiences. The cluster grows more adept at channeling their unique connection and are eventually able to ‘visit’ each other, so that Capheus in Nairobi and Sun in Seoul are able to carry on a conversation as they toggle between both cities. They can also ‘share,’ which the cluster’s mentor Jonas Maliki describes as “accessing each other’s knowledge, language, and skills.” Thus, Capheus, a Keynyan minibus driver, is able to get revenge on a gang that ambushed him by accessing the martial arts expertise of Sun, a Korean business executive who moonlights as an underground fighter. Similarly, members of the cluster can speak each other’s languages, as is humorously revealed when Wolfgang and Kala find themselves communicating inexplicably fluently in both German and Hindi. The sharing of knowledge and skills imagined in Sense8 can perhaps be productively thought alongside of a concept within Marxism that has enjoyed increasing popularity among the post-Operiaist strains of the European left: the general intellect. The term – used by Marx in one juicy passage but never fully fleshed out – describes human skills, technological capabilities, and expertise as comprising the general intellect. Bifo Berardi has updated the concept by describing the collective knowledge and abilities of information workers, or the cognitariat, as the general intellect of the digital age. Despite the incredible sharing of information provided by information technologies, Bifo argues, the general intellect remains alienated and divided as individual cognitarians are stuck harnessing their abilities towards individual or corporatized interests rather than for collective social benefit. The internet is a bad kind of sharing: the current surplus of information and stimulus leads to desensitization and depression rather than connection. Against this state of affairs Berardi posits that “the solution to our problem of impossible solidarity is in the self-organisation of the general intellect as a body.” To re-compose the general intellect we need to reactivate the slowness that comes with sensuality and the body. In a certain respect, Sense8 is one attempt to imagine alternative and more sensual forms that solidarity could take in a moment of informational speed-up and globalization. It envisions the general intellect as an embodied form of empathy beyond the limitations of language and space: the hive-mind as affinity group or commune. I’m not suggesting that the Wachowskis read Bifo. In fact, the show is more interesting if you assume they have not. In being both anticipatory and symptomatic the show is a great example of the perhaps unconscious work that mass culture can do. We cannot shirk from admitting that the politics of the show remain as vague as the sing-a-long of 4 Non Blondes’ “What’s Up” that the cluster spiritedly performs. Like their characters, the creators of the show may indeed “pray every single day for a revolution,” but their understanding of revolution is as hazy as the ‘90s-era technological optimism that has animated their work. However, a subplot of the show reveals some of what is at stake in its imagining of empathy as a form of the general intellect. Our eight protagonists are hunted by Doctor Matheson, a.k.a. Whispers, a traitorous older sensate who defected from his cluster in order to hunt his own kind. He uses his empathetic abilities as a form of mind-control, lobotomizing other sensates to put their abilities at the service of shadowy governmental and corporate interests. Nomi Marks, a transgender hacker in San Francisco, narrowly escapes her lobotomizing surgery only to discover what her fate could have been. She tracks down Niles Bolger, who was successfully reduced to a vegetative state and stares into space unresponsively at a Bay Area mental institution. Later that day, Niles is remotely activated by Whispers to assassinate Nomi. When he fails, the sensate is made to kill himself. Niles’s sensate abilities are converted into expendable labor by Whispers and his corporate bankrollers. Captured sensates like Niles are figures for the precarious worker who must endure long periods of unemployment but must be ready at any moment to leap into action. This hyper-exploitation is the fate that awaits the entire cluster unless they can ban together, using each other’s skills and abilities – Capheus’ escape-car driving, Kala’s homemade explosives, Wolfgang’s ruthlessness, etc. – to avoid capture. Sense8 thus reveals the potential power of the general intellect in its resistance to precarity and exploitation. The show argues in a time-honored fashion that a people that recognizes what they share in common is potentially unstoppable. Solidarity, as the old phrase goes, is a weapon—something that the deep state forces in the show are all too aware. For them, the empathic abilities of the clusters must be stopped, or better yet harnessed to capitalist valorization. De-alienated and communalized, the general intellect is simply too dangerous.